A foreign currency exchange is one of the best ways to change euro coins and here at Cash4Coins that is exactly what we do. We can convert and exchange all of your unwanted euros and foreign currency that you have lying around the house, which the banks will not exchange due to the costs it incurs when repatriating the money. At Cash4Coins we offer a service that is second to none and which has helped our customers to make use of leftover currency and also out of date currency such as old British 50p coins. If you missed the cut off point for this old currency you will be pleased to know that we can change this for you. It’s all part of our service and we even count and sort it for you too! 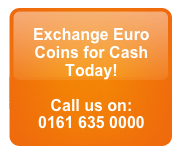 Why not club together with friends and family to see how many Euro coins you can get together. We do change any currency however so if you have French Francs, Deutsch Marks or any other currency you want to make use of, you can send it to us at the same time. We pride ourselves on our very fast and efficient service that we provide to all of our clients and the very competitive rates of exchange on your currency that we offer. Cash4Coins are always on hand to advise and help with any queries regarding the best ways to change euro coins and all your currency, we will even exchange out of date sterling and old Irish currency. The process is really very simple, once you have sent your currency to us, our team of specialists will count and then recount the money, we will then contact you with an offer and once you accept you will receive your money with our very quick payment procedure. In the unlikely event that you are not entirely satisfied with the offer we make, we will return the currency to you at no expense to yourself. What’s more if you have a collection of coins and it weighs over 5KGs, Cash4Coins will collect it free of charge by courier. If you’d like to send us coins today then go to our page ‘How to send us coins – if you want to see what our customers say about us then look at our customer comments page. So if you are searching for the best ways to change euro coins or foreign currency, contact our team for more information, we are always happy to hear from you and help with your queries. We have been providing our service for years and we are waiting to help you make sure of your leftover currency or old British or Irish coins now. It really couldn’t be easier to make a little extra money and with our local collection points we make it easy for you to send your coins to us too. If your coins weigh over 10KG we will send our secure courier to pick them up from you totally FREE of charge. That’s outstanding service we think you will agree!